Hampshire Mall is pleased to announce our Passport to Savings program! The Passport to Savings will provide exclusive discounts at some of our most popular entertainment and dining venues from July 20, 2018 through October 13, 2018. Bring your passport in to participating retailers to redeem an offer. 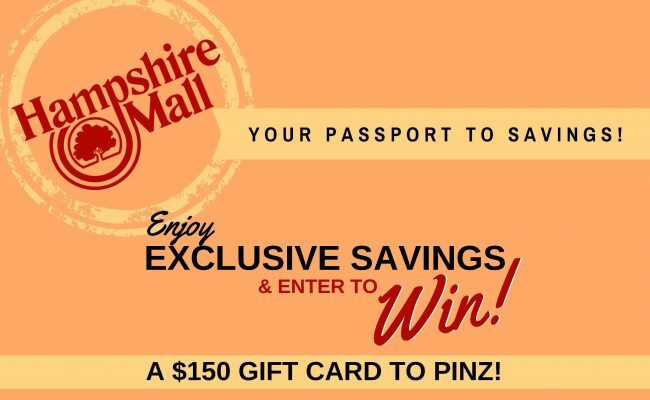 Once your passport has been filled up, drop it off at the kiosk in the food court to be entered to win a $150 gift card to PiNZ! Passports are available through the Amherst and Greater Northampton Chambers of Commerce, the Greater Springfield Visitor and Convention Bureau, and The Naismith Memorial Basketball Hall of Fame in Springfield. They are also available at the following hotels on Route 9 in Hadley–the Courtyard Marriott, Holiday Inn Express, Econolodge, and Howard Johnson. A limited number of passports can be found at the kiosk located in Cafe Square, as well as the participating retailers. Play one room, get your 2nd room half off at All In Adventures. Buy any large pizza and get a large cheese pizza free at Arizona Pizza Company. Buy one race, get one race free at Autobahn Indoor Speedway. Buy one regular skating admission at Interskate91 or one game of Laserblast at regular price, and a second person is admitted for free. Get one free game of bowling at PiNZ with a purchase of a meal. See passport card for full offer details, exclusions, and contest rules.